For the past three weeks I’ve been wrestling over whether or not I was going to go away on a trip this spring. I don’t have enough time at the moment to get away on one of my long distance tours, but I was sure I could get away for a couple weeks and keep my business on track. I knew I wanted to get away, but was unsure how I could make it happen. After all, I have bills to pay, a business to keep running, and people depending on me for all sorts of different things. How could I abandon all that and pursue my dreams of yet another bicycle adventure? If you’re like most people wanting to get away on a bike trip, you’ve struggled with some or all of the abovementioned questions. You want to go on tour, but feel that your responsibilities and financial obligations are holding you back. On the other hand, you know that going away will be worth whatever you give up to go… and you know that once you’re out on the road, you’ll be happy that you made the decision to leave. So how do you make that decision to leave everything behind and hit the road on your bike? Announce your trip to the world! As soon as you mention your trip to your friends, family members, and co-workers, there is no backing out. As soon as you tell someone you are going on tour, you’ve made a commitment to yourself and to that person that you have to follow through with. Having such a commitment is one of the easiest and fastest ways to turn your bike trip into a reality. If you’re currently in a situation where you are wrestling over whether or not to leave on a bike tour, the first step is to make the decision in your own mind that you are going. When you make this decision, it isn’t important that you know exactly how the trip is going to take place, how you are going to get the time off work, or how you are going to afford the vacation. You can figure all of that out later. What’s most important is that you make the commitment to yourself that you are going to do what you say you are going to do. As soon as you’ve made that decision, start telling people about it. This turns the trip into a reality. You can’t back out now, because how would that look to all those people you just told? Not very good! You’d look like a quitter! You need to tell people so that you have no other option but to make the trip actually happen. Then, after you’ve made the decision to go and you’ve told other people that you are leaving, then it’s time to figure out all the details for the tour. Work backwards and determine everything that needs to be done before you leave on tour to ensure that the trip is the adventure you’ve always dreamt of. When you work backwards like this, you’ll not only make your bicycling dreams come true, but you’ll accomplish a whole lot more than you would when working from the beginning and taking one step at a time. You’ll become a better person along the way and you’ll have fun planning and preparing for your trip. Best of all, you’ll make your trip happen faster than you ever before thought you could. Speed is good when planning life goals. Act fast and regroup along the way! 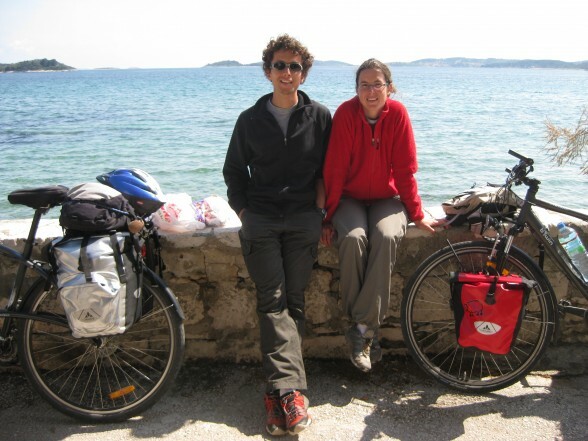 This entry was posted in Bicycle Touring Pro Articles, Featured How-To Articles, Main Articles, Planning and tagged announcing your plans, bicycle touring, do I have to go, goal setting, goal setting for bicyclists, how to tell your family, how to tell your friends, how to tell your parents, planning for a bicycle tour, tell the world, touring promotion, touring publicity. Yes, when you are worried about having a place to sleep each night and you want to have everything planned out in advance, you do indeed need to make some kind of itinerary for your trip. This is admittedly a pain, because it doesn;t allow you to deviate from your route or timeline. But it does give you a guaranteed place to sleep each night, just so long as you can get to your destination at the end of each day. So, when it comes to planning out your distances, it is a good idea not to get too crazy. If you try and plan a super long day, then you risk not being able to reach your destination at the end of the day. Traveling cyclists usually go about 50-60 miles in a single day, but if this is your first bike tour or your are cycling through especially mountainous areas, you should plan to do only 30-40 miles per day (at least at the beginning of your trip). With that information, you should be able to plan out your route, find lodging every 30-60 miles, and schedule out each day of your trip. It takes a lot of work, but if you want to have a guaranteed place to sleep each night, it is totally worth it. I hope that answers your question. If no, comment again and I’ll try and explain a bit further.